I’d imagine you’re all familiar with Phillip P. Bliss’ hymn Let The Lower Lights Be Burning, and the story behind it. Lighthouses are the giant, unwavering beacon in the night that keep sailors safe. And Bliss’ song and the lesson behind it compares those lighthouses to God’s word, that when “dark the night of sin has settled”, shouts a warning for all to hear that they should avoid the wreckage of sin. But Bliss knew the importance of not only the bold lighthouse of God’s word, but the steadily burning lights along the shore of a safe harbor. Those lower lights that told the sailors where to go for safety in a time of trial and would be kept burning all night through a storm. And the Bible is full of examples of those lower lights, stories that don’t involve miracles like parting the Red Sea or acts of great faith like David slaying Goliath. Stories more like wee little Zacchaeus climbing a tree to see Jesus and Barnabus, who never seemed to strive for notoriety in the church but was content to be a son of consolation and do what he could to help others rather than himself. 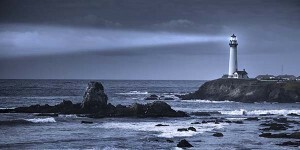 Those “lesser stories” of faithful Christians should be just as much of a guide for us through the storms of life as the “lighthouse stories”. 1 Peter 3:1-2 tells us of husbands that are saved without words being shouted at them like a beaming lighthouse in a storm, but by the quiet and steady example of their wife’s life-letting her life be a lower light that guides him to the truth. Titus 2:2-6 gives a great example of how a church family should function….just the same way our physical families should function, with the older Christians taking the younger under their wing and being a steady lower light of influence to them. Older men are to be sober- minded, dignified, self- controlled, sound in faith, in love, and in steadfastness. Older women likewise are to be reverent in behavior, not slanderers or slaves to much wine. They are to teach what is good, and so train the young women to love their husbands and children, to be self- controlled, pure, working at home, kind, and submissive to their own husbands, that the word of God may not be reviled. Likewise, urge the younger men to be self- controlled. These passages plainly teach us that in order to serve Christ’s church we don’t necessarily need to be swallowed up by a great fish like Jonah or call down fire from Heaven like Elijah. We can do much in service to Christ by keeping “this little light of mine” shining all around the neighborhood without the Devil ppffffffttttt-ing it out. The problem with lower lights, it seems to me, is that they’re just not flashy enough. There’s nothing exciting about hearing Tom Bodett say, “We’ll leave the light on for ya.” Everybody seems to be wanting to sling smooth stones at giants rather than climb trees to listen to Christ preach. 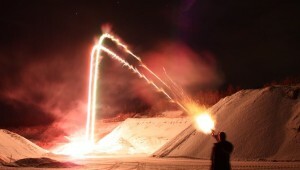 I think a lot of Christians are more comfortable with the idea of being flare guns for Christ than lower lights. They want to be flare guns because they want everyone to see them, right now, when they’re ready for people to see them. Either because they’re suddenly in need of help or for a brief moment they’re ready to help someone else (but it better happen fast, because there’s no telling how long it will be before the light fizzles out). Now flare guns can accomplish the same goals as a lower light, I suppose. They both send out a signal that says, “I’m over here! Come over here! I want you to know where I am!” And flare guns can be good because they shoot high into the air and let the world know where you are. But have you ever actually seen how a flare gun is packaged? You’ll likely see some sort of warning along the lines of “Caution: For Emergency Use Only”. They’re often boxed up tight in waterproof containers, they’re not loaded and ready for use and are only packaged with a few flare bullets (or whatever you’d call the flare thing you shoot out of a flare gun). The point being that nobody buys a flare gun with the intent of ever having to use it. 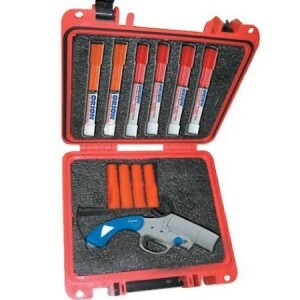 It’s a last resort, an emergency provision that you only carry around in case of the worst possible scenario. Jesus admonishes us in Matthew 5 that we are the light of the world and that we should let that light shine before men. But have you ever known someone who had more of a flare gun kind of light? It’s shot off into the dark night of sin every once in a while but quickly fizzles out, and not too often lest their resources be depleted. I know it’s much easy for me to slip into flare gun mode and BOOM—send off a light for everyone to see for just a few minutes than it is to keep a steady glow burning all night long. But that’s what we need, more steady lights and fewer flare guns. I’ve had to resist the urge to fall back into flare gun mode recently. How has your light been?